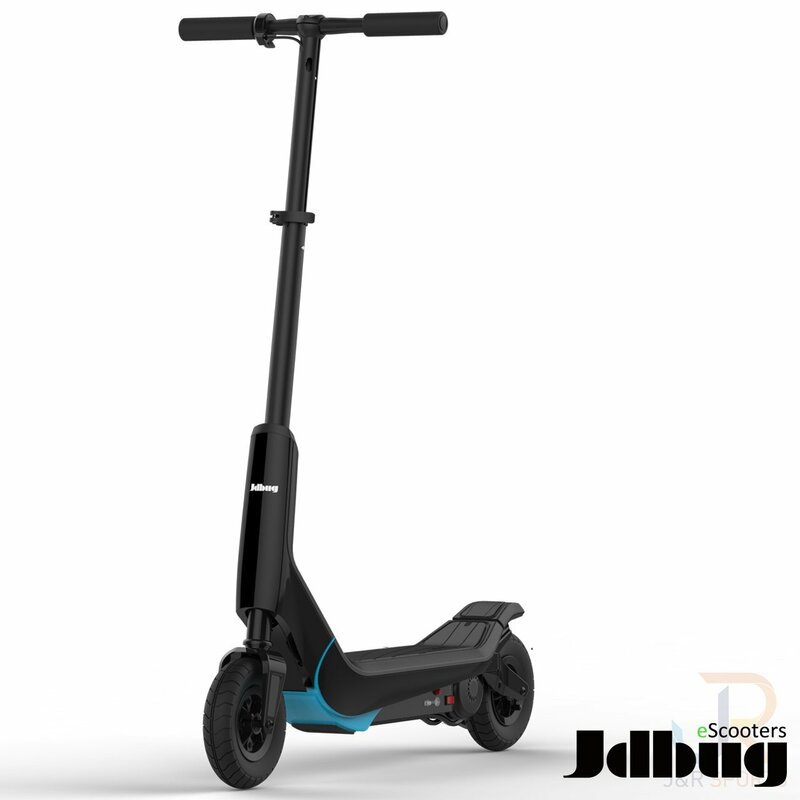 The JD Bug sports electric scooter is a fun option for minor off-roading adventures. If your commute has some bumpy pavement that most scooters can’t handle, this is might be a great option for you. It conveniently folds down for easy storage but also boasts 8 inch inflatable tires that can handle rough terrain at a speed of ten miles per hour. While it has nice acceleration, it’s can be frustrating when going up hills as it is quite slow. Additionally, it’s slightly too heavy to truly recommend as the best option for a commuter. It needs two and a half hours to charge and can run for 40 minutes on a single charge. All in all, good value for the reasonable price. 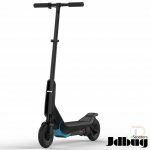 The JD Bug E-Scooter is a pretty interesting solution for problematic terrain that most scooters couldn’t handle. It’s best for uneven pavement, road patches, and sidewalk cracks. Light gravel and stones is the max I’d recommend from just the motor itself. Anything more rough than that I would suggest alternatives. The speed is constant even as your transition to different levels of terrain. The tires work really well at transaction and climbing over odd obstacles. The scooter is about 40 pounds and that can be a deal breaker for some. You’re certainly getting benefits of what terrain it can cross and the motor power but the weight is a big drawback if you have to haul it around between riding distances. As with most scooters it folds down nicely, and with it compact the size is similar to a standard folded lawn chair. I really like the design approach to it. The aesthetics are more tactical and modern. Even though it’s a scooter it doesn’t look too out of place when riding it. In the U.S. the alternative transportation culture isn’t too big outside major cities and I think the design helps break that trend. It’s very sleek, quiet, and doesn’t draw as much attention as other electric scooters often do. Overall I’d say this is a good commute scooter if the destination can be made by mostly riding and has some difficult urban terrain along the way. Anything more challenging I would recommend a more heavy duty scooter or even an all-terrain bike. For the price it can be a really affordable option for those seeking a solution to the problems mentioned above while still keeping the ride conservative. The design, the price, and the power have a nice balance to it when you consider other products in the same category. Fun ride, but the range doesn’t match up with what’s advertised. Even with an underweight rider, the range crapped out at almost half of what was promised. I’ve ordered a replacement, hopefully this was just a malfunction. Nice and compact. I take two trains to work, and it’s unobtrusive to take along on my commute. It’s an easy ride, definitely a good bang for your buck. Loved it while it lasted! Perfect for my downtown commute, easy to fold, lightweight, speed and range and battery were all good. Unfortunately after 6 months the battery stopped holding charge well and the range was down to 2k. I sent it back, but am looking now for a new one. Maybe mine was defective?